For the past four days, we’ve been dog-sitting for Jeremy & Hercilia, living a life of ease and comfort at their house. What a convenience it has been to have hot, running water for bathing and dishwashing, space to peel off dirty shoes and filthy clothes before entering the house, and most of all, a real kitchen! It's been pretty freaking sweet. We're definitely getting the better end of this favor. Today is our last in the lap of luxury—Jeremy and Hercilia will return this evening. Soon, it will be time for us to hike back "upstairs" as we call it, home to our little camper. While Tyler works in the living room, I throw in a load of laundry, and wash the dishes that have accumulated. When I'm through, Roscoe follows me around the house as I pick up our belongings. Tyler is lost in programming la-la-land and barely notices what I'm up to, or the fact that I'm now leaving, headed to the camper to clean. Last week, we left in a flash, leaving dirty dishes and a mud-streaked floor in our wake. I know that if we move back in to a messy space, we will be extremely unhappy campers. Making the most of a quick break in the nearly continual rain, I head across the street and squelch through the mud up our very long driveway. Arriving at our waterlogged clearing, I make my way through a sea of grass and open the camper door: it's worse than I thought. Our tiny sink of dirty dishes is now covered with furry mold. The overhead bathroom window has been left open, so there's now a puddle of rainwater on the lid of our bucket/toilet, and wet sawdust all over the floor. It looks just like the pee-soaked stuff in the bucket. The bucket itself is full, it needs to be emptied and cleaned. Thankfully, this is the last time I'll be doing this chore, since I recently purchased some compostable loo-liners. If we had running water, cleaning would be no big deal. Right now, our hand-pumped well really adds to the annoyance level of this task. It's high time we got a cistern—we could pump for 10-15 minutes each morning and have all the water we need on demand. Swearing under my breath, I heave a bucket of crap-and-sawdust into the first bay of our our composting system. We really should built a roof over the central bay, I think. As it is, the straw bales we're using as cover material have basically sprouted into grass and are now home to a family of jaunty little mushrooms. I plunge my hands into the wet, decaying straw, and toss it on the pile. It takes another hour or two of complaining and cleaning before I realize that I'm ruining my day. As I transform our messy camper into a clean, cute little home, I take care to listen to the chorus of birdsong that grace our woods. 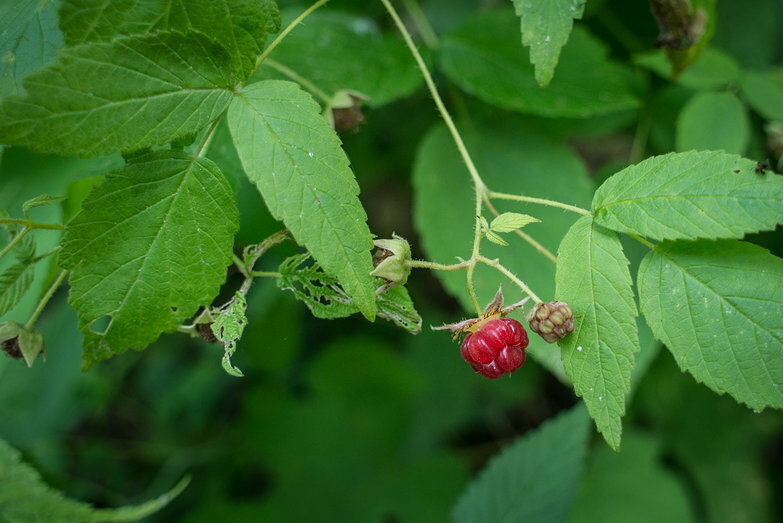 As I empty the dishwater, pouring our greywater bucket over the compost pile, I stop to pick a wild raspberry from the brambles around our clearing. Popping the tart berry into my mouth, a smile breaks through my cloudy visage like the sun, and I remember what we're doing here. Knowing that our dear friends Mary and Jack are driving out to see us in just a couple of weeks! Weekend trips to look forward to—we're headed to Maine to see Mike and Eliza next weekend! Watching the show Grand Designs, that Mike and Katherine told us about. It's so much fun commiserating with all of the burnt-out couples building their houses, watching as their projects take way longer than anticipated, and cost loads more than they imagined. This is what makes the climb … this crap. When I go on Pinterest these days, I have to laugh at all the "rustic” photography that once inspired me. The hazy wedding woodland photoshoots, complete with birchbark-coated cakes and marzipan mushrooms, the waify women with bare feet and a flowy skirt in a field of tall grass, the shot of two skinny, plaid-wearing hipster models making chemex coffee while camping in the rain, etc. Those legs in tall grass should be like mine: a red polka-dotted array of insect bites of varying itch-factors. There should be ticks crawling up them, lodging themselves in soft flesh. The waify dress-wearing girl (god if only I could wear a pretty summer dress without fear that I'd completely ruin it with mud and sweat) should be flailing around, swatting away the black flies. The rustic tent, I’m sure, is absolutely filthy, with dirty, wet laundry hung throughout it in a futile attempt to dry it. The chemex? Surely it will be accidentally kicked into the mud by a steel-toed work boot or a wayward excavator, breaking its kinfolk-y self into a hundred pieces. Maybe someday our lives will be stylish, but in the meantime, it's on with the dirty life. Tomorrow morning we're heading straight to our old house near the woods. The amount of work required to turn it into a home is daunting at this point. We'll be there for two whole months (no phone or internet) and try to figure out if this is what we really want. After all the stress (and fights) about what to bring, what to do, how much money to spend, when to leave, etc, etc, it's been so nice reading your article just a few hours before we leave. Made us laugh and filled us with hope. Thank you! Cristi- I cannot tell you how happy I am that this entry brightened your day a little bit, and gave you hope! Ooof, you do have a daunting project ahead of you. I have no doubt that it will be completely worth it, though! Best of luck to both of you!